I have written several articles teaching you how to cook better, season better, and how to anticipate the needs of your loved ones as they go through chemotherapy. Today, I am going to shift the focus from how to cook to what is quite possibly the more important focus which is eating more. The focus of this article is on some basic psychological techniques that we can do to “train” our loved ones into being more enthusiastic about eating. The first idea I'd like to discuss is often referred to as classical conditioning. Classical conditioning is where a stimulus (like a ringing bell) is applied to a subject (like a dog) during a specific event (like meal time) and the subject (over time) begins to associate the stimulus with the event, even though they are completely separate events. The classic example is when a researcher would ring a bell every time he would feed his dogs. After awhile, the dogs would begin to salivate with anticipation of food every time the bell was rung even if no food was presented. We are going to use this idea to train our loved ones to become hungry whenever we need them to be. We could employ this strategy a few different ways. You could actually physically ring a dinner bell before you started cooking or before you served dinner. You could play a certain song or style of music . You could always start a meal by sauteeing garlic. There are an endless number of ways that you can make this happen. The choice is completely up to you. The beauty of association is that it is a passive effect, meaning that it happens whether you intend it to consciously or subconsciously. What I did was to play old Sinatra style vocal jazz, and to saute garlic before every meal. As my mom heard the Sinatra, the sounds of cooking, and smelled the sauteeing garlic, she slowly began to associate these with the act of eating, which when combined with my Cooking for Chemo techniques helped to build her appetite and go back for seconds. The second idea is called positive association. Positive association is a pretty simple concept. Event A occurs and it causes a positive event or reaction. For example, I eat chocolate and I become happy. The chocolate itself doesn't make me happy, but because of years of being happy when I eat chocolate I associate chocolate with happiness. Another example would be when I take the time to get dressed up nice. Every time I get dressed up nice, I get lots of compliments (no I'm not bragging). These compliments make me feel good about myself which in turn makes me more likely to wear my finest duds on a regular basis. This occurs because my brain has learned that suits = feeling good. We can achieve this same result with some simple techniques. Always praise your loved one when they eat. Encourage them to take that extra bite, and tell them how proud of them you are for having the courage to eat. Make certain to make every food related experience as positive as possible. The third concept we need to discuss is negative association. Everyone has a bad experience with some form of alcohol that they have drank too much of at some point in their life and then subsequently become sick from over indulgence. Usually this association of becoming sick from an alcoholic beverage returns in the form of nausea whenever the beverage is discussed, or even worse sniffed. The same events can transpire with food if we do not manage nausea proactively. If your loved one becomes sick on chicken noodle soup, you better believe they will not want to eat that soup anymore. Work with your doctor to prescribe anti-nausea meds that work for your loved ones, and see my article on nausea to help combat nausea when cooking and eating. Armed with these new ideas, you can become a proactive and an even more effective cancer caregiver than ever before! The science here isn't perfect but this is a great place to start. 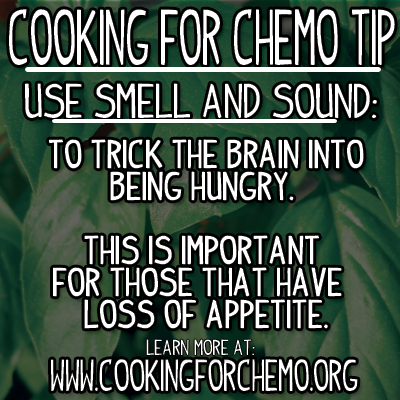 You can purchase my cookbook, Cooking for Chemo ...and After! by going to Amazon or Barnes and Noble.